I should be a pro at this Valentine's Day stuff with all of the Hallmark movies I have watched over the last few month, but I always find this holiday a kind of difficult one to decorate for. Maybe because I feel it is a bit limited - how much can you do with red hearts?! or maybe get real daring and use pink hearts? or double dog daring and use XOXOXO's? But I threw caution to the wind and this is as daring as I get! 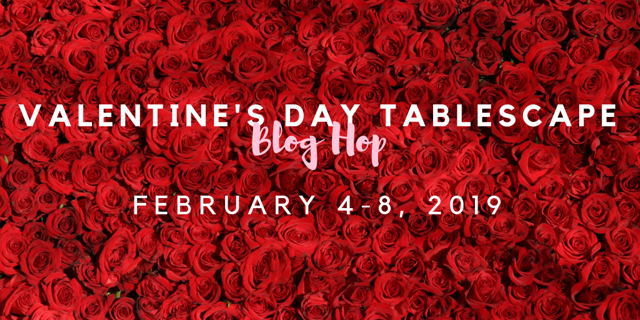 I am happy to be part of the Valentine's Day Tablescape Blog Hop that Chloe Crabtree, from Celebrate and Decorate, has put together. There will be 24 different talented table stylists showing off their Valentine tables just for you to enjoy. Check back each day, as I will be updating the links at the bottom of the post all week long. So, for my table I added some brown to the mix of red and pink!! And that isn't all that daring when you consider that chocolate is brown and that is one of the most popular things about Valentine's day! My inspiration was the floral paper that you see on the hearts, it is a beautiful mix of a dark khaki, pink, red and sea foam green. I tried to mix the sea foam green in somehow with my dishes, but trust me - it looked horrible! I used several sheets of my favorite Valentine paper from Stampin' Up! to create an embroidery hoop collage above my mantel and then moved that color scheme onto my table. The hardest part about putting together this table is that we were in a polar vortex this past week with temperatures in the negative degrees, and wind chill factors making the plunge unbearable. So I was not about to go out and go shopping for anything new. I had to make due with what I had. I wrapped some old red Christmas candles with khaki colored paper cut with a heart die cut and placed them in a wood tray I had - along with some white wood heart ornaments for a simple centerpiece. The wood hearts were Christmas tree ornaments, after adding the paper to the middle and that beautiful soft variegated ribbon to the wood hearts it looked much more appropriate for Valentine's Day. I was going to make some cute little chocolate favors, but again, I didn't have any at the house and I wasn't really thrilled at going out in -25 degrees to get some chocolate. Worse yet, I would just eat it because I never left the house for three days and I didn't need to do that. So I opted for the little hearts on the easels instead of candy, much easier on the hips! Below are all the links to the wonderful Valentine inspiration for you to enjoy this week. 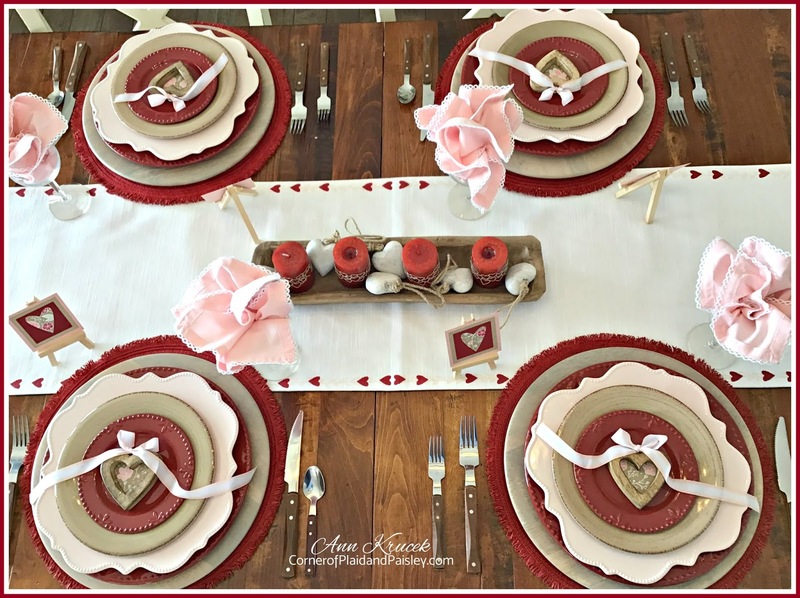 Check out each blog, I bet someone came up with a fabulous out of the box Valentine Table that is surely drool worthy! I hope you have a wonderful Valentine's Day and you get to spread some love. A simple smile or a well placed compliment can do wonders to spread that love around. 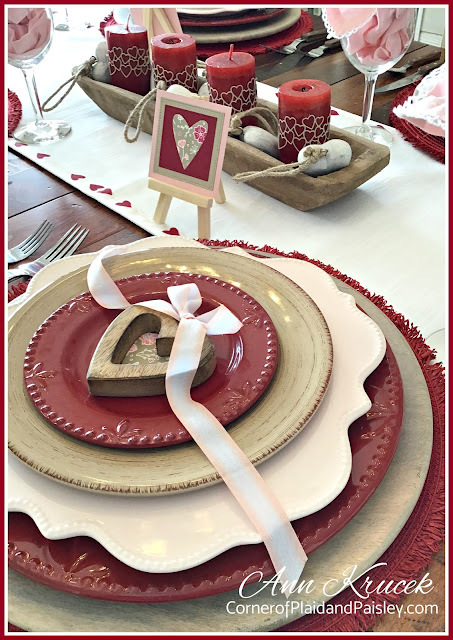 Absolutely lovely, and certainly chocolate is a good color for a Valentine table! Very pretty with the little heart frames. Anne, your comment about the Hallmark movies and you should be a pro at this Valentine's stuff did not fall on deaf ears, lol! I'm the same. Your table, though! The wall above the mantel and how you scattered a heart theme without too much red is perfect, I think. I love the wood and white in the mix. You are so good at the mix, woman, and very creative! sorry for adding the e to your name! 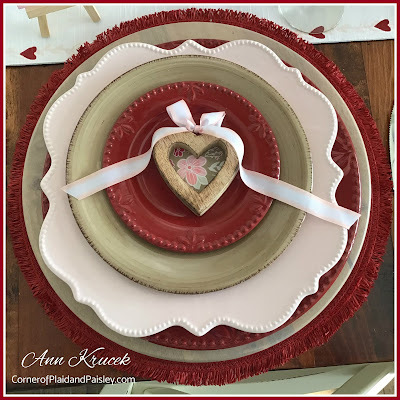 I think you captured the essence of Valentine’s Day very nicely Ann! You gathered together some great accents and your dish stack is a great color combination. I have to say that your mantel decoration is really cute. The Stampin’ Up hoop design is really creative! We had the same terrible weather and I was stuck home too so no fresh flowers! Ann, I think your table and setting by the decorated fireplace is wonderfully warm and inviting. How clever to embellish existing red candles and turn them into Valentines decor! I am so with you on not going out into the frigid weather, and especially the danger of having chocolate in the house LOL! Oh Ann, this is so cute and so sweet! I love the unique colors you used, and those hearts steal the show! Your mantel arrangement is so pretty and fun, tying everything together! I can't imagine what that weather must have been like, and I'm so glad you could stay home! Love the pretty plate stack and bright table runner~ I hope you've seen the last of extreme winter weather! Brrrrr Ann, I don't blame you for not going out into the cold tundra! The temps got down to mid 40's here in Florida and I thought I was going to freeze....LOL Thinning blood I guess. But you could not have made a more beautiful table than creating one with items you already had on hand. Just lovely. The wood hearts are adorable. Great job. Blog hopping with all our friends is such a pleasure, huh? How enduring and sweet. I loved all of your heart themed decor on the table and especially as it is paired with your wall decor above your fireplace. Hearts are the perfect symbol of love and your touches of them in the picture frames/easels are such a beautiful reminder of the bonds that keep us all together. Lovely. Stampin' Up! is blending in nicely with your blog design. Being able to create crafts is wonderful. Love the heart easels and those hoops are darling. So fun to join you on this blog hop. Thank you again for Janet's referral. Ann, I love your creativity. When I first saw the wall above your mantel, I thought it was plates. The embroidery hoops make a stunning display! You did a remarkable job using what you had, your table is so pretty and I love the mix of brown. I don’t blame you for not getting out, I can’t imagine how the negative numbers would feel. I always enjoy blog hopping with you! I love a deep stack and you delivered big time on this one! Your dough bowl is filled with the perfect accents and your mantle decor is on point. Beautiful styling! I am sending you hugs today, too!! Your plate stack is lovely and blends so well with your room! The rustic fireplace, mantel and the wall above your fireplace are all complemented so nicely with your sweet little hearts on your dishes. 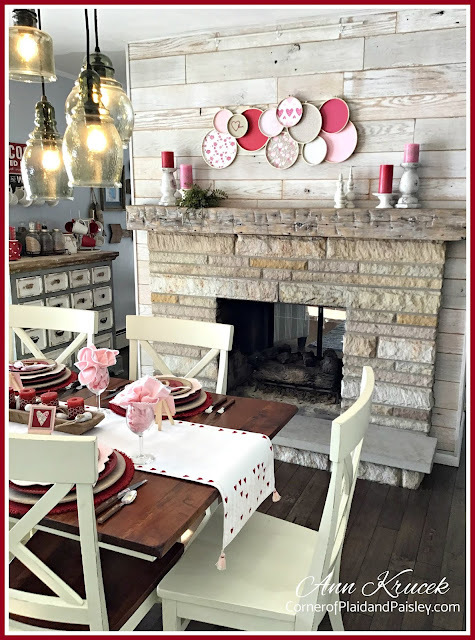 Thank you so much for once again sharing your table styling talents with the blog hop! You have gone all out, Ann. Love that overhead shot. Your mantel is amazing and that table runner and plate stack are fabulous. Hope your weather moderates soon.Ugh. I lived in Alaska for five years so I feel your pain! I love your table, The hearts on each plate are perfect. I got so inspired by the Valentines Day Tablescape blogs that I decided to host a little Valentines Tea for a few girlfriends! That's great, Ramona!!!! Glad we could be of some inspiration!! Enjoy!! Ann, the paper hoops on the mantle are a great decorative element for Valentine's Day. I've used fabric, but not paper. 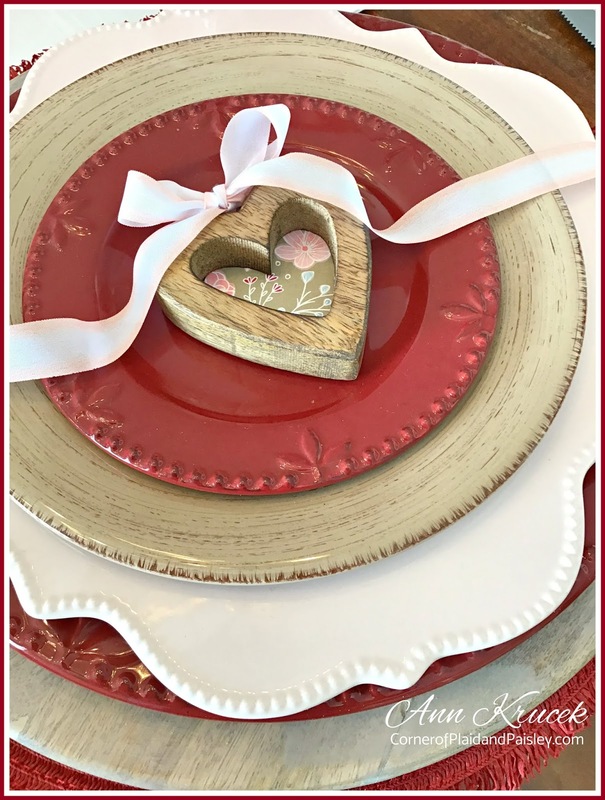 The hearts are so sweet on each place setting. Ann, you and I are kindred spirits when it comes to Hallmark movies. They are my favorite. I absolutely adore your Valentine's table. The plate stack is so pretty, and the pink and red color palette is perfect. 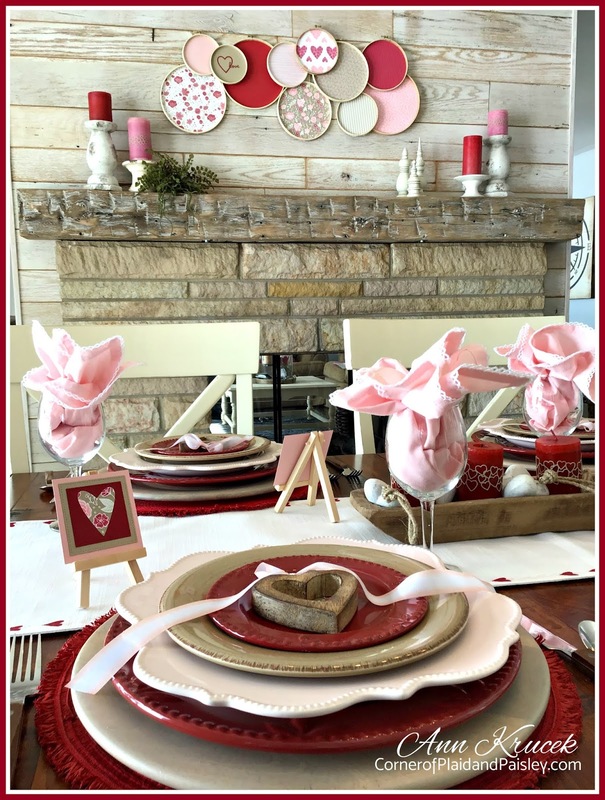 Your mantel in the background is beautiful and perfect for Valentine's Day! It has been so much fun being on this hop with you!!! Popped over from Bluesky at Home. Love this. Very festive! Even the mantel is adorable. Happy Valentine's Day! Glad I am not the only one who has been watching all those Hallmark movies! I just love your table! Especially your plate stack. Gorgeous! The little heart ornaments are adorable, and your attention to detail with the mantel decor perfect! So sweet and romantic, Ann! Love the athmosphere, and your wooden hearts are absolutely lovely <3! Perfect! Ann I absolutely love this! 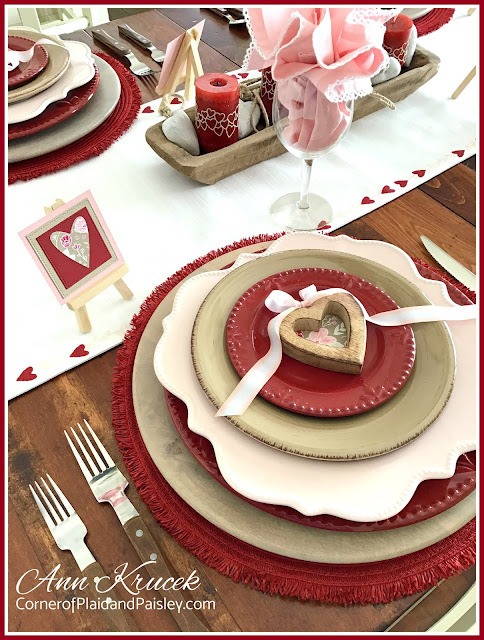 The touches of brown are perfect for tying in your Valentine tablescape with the rest of the room. This is so unique and pretty! So happy to join you on the hop. Have a Happy Valentine's Day! Your site is so precious. I'm a self-professed girly-girl and I love anything with gingham, paisley and bows. I want to check your site daily for inspiration. Can't wait to see what all you have for spring and early summer.